For the koftas, combine all the ingredients and with dampened hands form into 8 thick sausages about 10-12cm long. Thread onto skewers and chill while making the salad and sauce. To make the salad, finely shred the red cabbage (use a food processor if it makes it easier), mix with the beetroot and red onion. Whisk the lemon juice, olive oil and Canderel together then add to the salad and toss. Add the mint leaves just before serving. Mix all the ingredients for the cucumber and yoghurt sauce together. 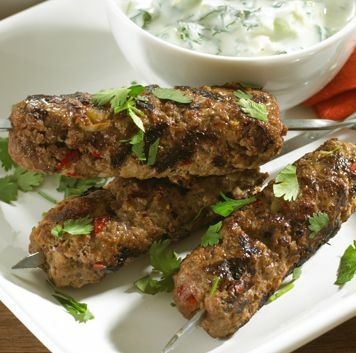 Cook the koftas on a preheated barbecue or grill for 10 minutes, turning them using tongs during cooking. Serve with salad, flatbreads or pita bread and dollops of the sauce.